YES, I with this protest movement! Together this will have a big effect. It's coming and now we have the day. Expect US!!! This is a very exciting day for the history of this country. I am convinced that no matter how successful it is the mainstream media will play it down to the greatest possible extent. But I have a feeling it's success will nullify their efforts to do so. I am saying a prayer that all right-minded Americans will heed the call to take back our democracy; will set aside their sense of duty and security for courage and the call of freedom! Here's to May 1st! I would like to put out a call for an all-out social media blitz to get the word out for this national strike! 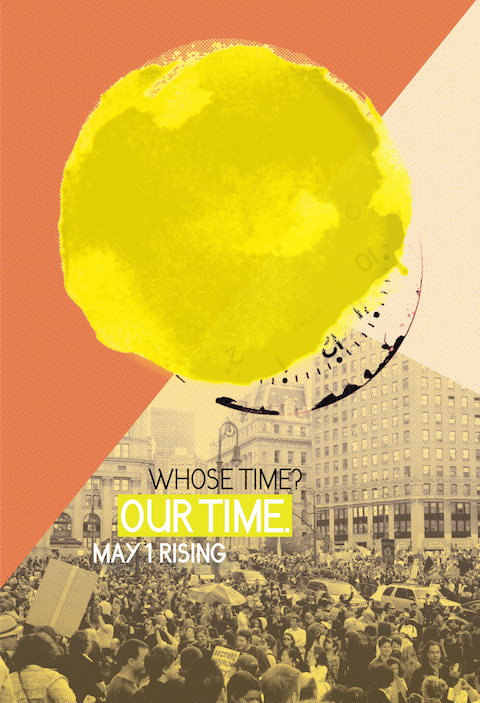 OWS and it's allies have done a great thing just by putting the concept of a General Strike into the atmospherics, and an added bonus is a revival of May Day and all it means in the land of its birth. FB, tweet, email tell everyone! Exactly what is this supposed to accomplish? "We are striking to halt the flow of capital" In effect throw a monkey wrench into the gears of our weakened economy. The flow of capital is not the enemy, the people who have stolen our Democracy are. What will the decent people think when they are not able to do business. Won't they be angry at the people who are responsible? Why hurt the innocent when our force should be directed at the guilty? This will hurt the movement, not help it. So exactly how will not going to school help? It won't help. It's a form of economic terrorism. Targeting the innocent working people for the crimes of the corrupt politicians and banksters. Political and economic struggle is nasty and not neat and clean. Like Mao said, "a revolution is not a dinner party, or writing an essay, or painting a picture, or doing embroidery; it cannot be so refined, so leisurely and gentle, so temperate, kind, courteous, restrained and magnanimous. Our own labor movement did not rely on the voluntary compliance of each and every worker in a strike. Picket lines were often rough and tumble affairs and accounts were sometimes settled with strike breakers later and in other places. Violence as well as appeals to reason is used by both sides to "convince" individuals to go with a particular program. The violence of the bosses would consist of the threat of hunger, police and gun thug attacks, jail. Strikers had to find "counterarguments". When labor forgot these things it began to be lost. Political and economic struggle is as nasty as we allow it to become. Will follow MLK and Ghandi's example. Well while MLK and Ghandi didn't lead violent episodes there were plenty of them in their time and they were integral to those struggles. Violence shown was integral to demonstrating who was on the side of injustice, non violence shown who was on the side of justice. I think each will do what he or she can do. This is an early baby step. You didn't answer the question, if it won't help then why does the list include no school. to spend time with family, to protest against the failing education system k-12, to protest the ever increasing fees and tuition hikes. I'm not in favor of the tactics of the strike. If you look at my response above that begins with "We are striking to halt the flow of capital". The quoted words are what I'm responding to from the original post. The strike lacks a goal. If we want to make real economic change, we must force that change. It will not be given to us. A one day general strike with no clear direction of that force is like our raised fist taking a single punch at a thousand different opponents, landing on none of them. It feels like you are doing something positive but nothing is accomplished. The strike IS the goal. I'll have to assume you didn't read all that stuff up there above your comment. This is called The Occupy Movement and we occupy public spaces and sometimes "private" ones, such as banks. We do this to create a chain of events. This strike is just one link in the chain we began creating back on Spt.17. All this hullabaloo in the streets is simply to make noise so that the kings of wall st. may hear us, and so that the corporate media hears us, but most importantly so that the rest of the people not out on the street, the 99%, can hear us loud and clear. We are a New Wave of change and we know if we struggle now the future will be ours and our children's and their children's and NOT for the bankers, the Billionaires like Bloomberg, and not for the crooked politicians who represent the interests of the corrupt capitalist class. We are going forward to create a new America in peace (no wars) with itself and it's neighbors; creating beauty and goods for all. The core of all this will be the working and middle classes: the wheel of historical change. Mayday is the International Day of the Working Classes! See you in the streets and let's make noise!!! I don't live in America, so someone please inform me of how this go's. Thank you. It seems the above article should satisfy most of your questions.